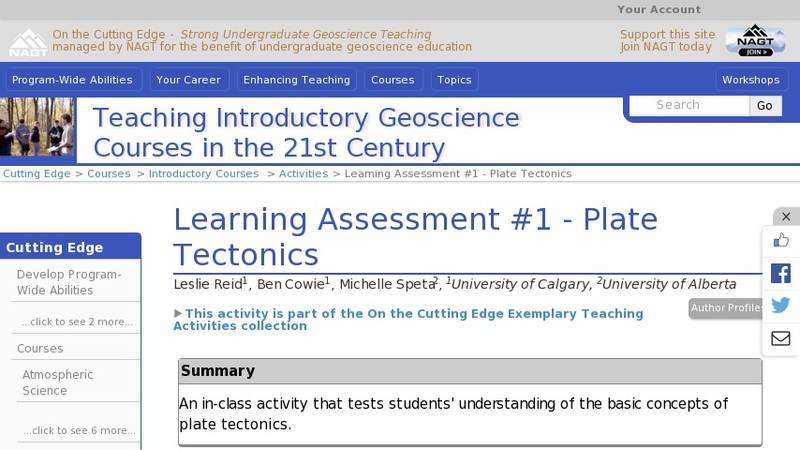 In Part 1 of this activity, students are provided with a blank topographic profile and an associated tectonic plate boundary map. Students are asked to draw a schematic cross-section on the profile down to the asthenosphere including tectonic plates (with relative thicknesses of crust etc. appropriately illustrated), arrows indicating directions of plate movement, tectonic features (mid-ocean ridges, trenches and volcanic arcs) and symbols indicating where melting is occurring at depth. In Part 2, students are asked to provide geological and geophysical lines of evidence to support their placement of convergent and divergent boundaries, respectively. A bonus question asks students to predict what would happen if spreading along the Atlantic mid-ocean ridge were to stop. Students are referred to appropriate sections of the textbook to guide them in completing all the parts of this activity. Students are also provided with a checklist of required elements for both parts of the assignment.